Bartholomew's 'Quarter Inch to Mile' Coutour Road Map of the Environs of London. This is a rare c. 1928 map of London, England, and its environs. 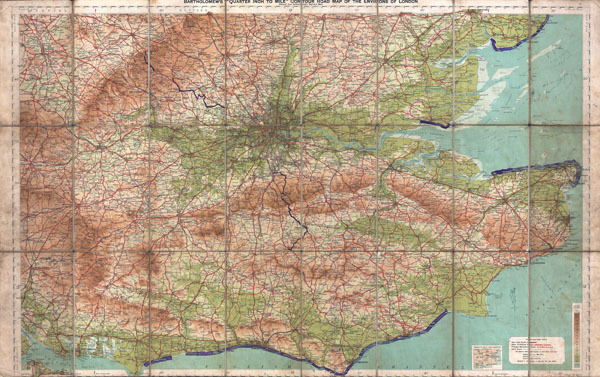 Covers from Portsmouth eastward as far as Ramsgate and northward as far as Oxford and Colchester. Includes London with basic streets and roadways noted Includes routes for road, bicycle paths, and trains. Prepared by John Bartholomew in conjunction with the Ordinance Survey and published by Edward Stanford. Designed with the traveler in mind and thus bisected and backed with linen for easy folding. Very good condition. Backed with original linen. Bottom margin narrow. Light discoloration on original folds. Royal Scottish Geographical Society, C17:40.